Here's a pattern I developed which gives a simple stockinette six-pointed star--suitable for snowflakes for you Christmas tree or Stars of David for your Hanukkah bush. One knitter has reported attaching these to a length of I-cord to make bookmarks. In size 10 crochet cotton on 2s, this is more than 4 inches across. Cast on 12 sts--I use Emily Ocker's method--and join into a circle on double point needles. Knit one round through back loops. Pattern given is repeated six times per round. Even rounds knit plain. Bind off after a plain round. I don't know how far this pattern can be extended without running into some sort of trouble, but as it gets bigger the stockinette portions give some space for lace patterns, and crocheting around the edges can also add some snowflaky elements. 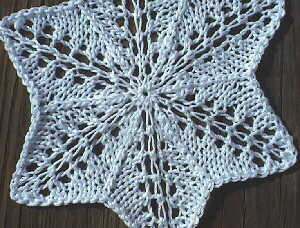 This pattern can probably be worked as a 5-pointed star by casting on 10 instead of 12, but I haven't tried this. As to stiffening, I prefer starch over white glue for two reasons: starch can be washed out and redone if the object gets crumpled, and white glue isn't all that white, it's a tad yellowish. Copyright statement: This is an original design by Judy Gibson, October 28, 2002. Permission is granted to print and use this pattern for personal noncommercial use, provided this notice is included. No commercial use or publication of this design--in hard copy or electronic form--are permitted without explicit consent from the designer. Contact: jgibson@cts.com.